On June 1, 2016, Cart2Cart celebrated its 7th birthday. Driven by your trust and loyalty, we achieved more and went further any of us could expect. 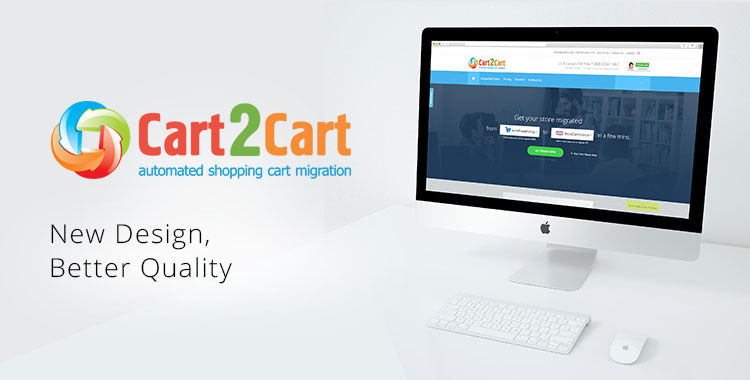 Starting as an enthusiastic idea, Cart2Cart is now an undeniable leader and #1 solution for shopping cart migration with more than 70 supported e-Commerce platforms and more than 30,000 of successful migrations. Over the past years, we did everything possible to bring you an excellent migration experience that would eliminate any barriers on your way to success. And today, we’re honored to present our biggest update yet — a complete overhaul of Cart2Cart design! The changes you see to the user interface were not done overnight. For months we were working hard to change the look of Cart2Cart, to modernize the service but to keep its identity, to make it more straightforward but still comprehensible and easy to use. As the result, we took away everything that could distract you on the way of performing a qualitative migration and came up with a clean, conservative design. The simpler, the better — that’s the logic behind the changes happened to the Migration Wizard. We completely rethought its concept and reduced the number of steps migration takes to go through from 7 to 3 only. Thanks to a distinctive design and a much more elaborated logic of migration setup, you now need up to 50% less time to get your automated migration started. We also added a number of detailed hints and demonstration videos to make sure you fully understand how and why to perform each of the required actions of the migration setup. We couldn’t ignore the increasing number of traffic coming from handheld devices anymore, and, finally, took action to enhance mobile experience for our users and make it unforgettable. 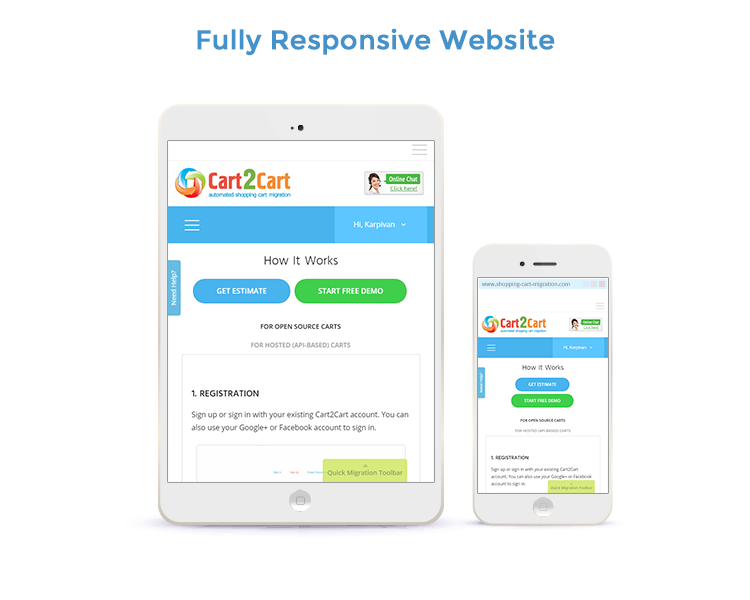 At last, Cart2Cart service website is fully responsive and perfectly optimized for usage on the go. We discovered our old website was a bit complicated for less sophisticated users visiting Cart2Cart for the first time. The design itself was rather outdated too. Thus, we decided to get rid of all distracting elements and an outdated look, just to make it easy and enjoyable for you to spend every second at Cart2Cart. We also structured our content properly, added a showcase section to our homepage, testimonials and refurbished an e-Commerce blog. That said, we managed to preserve the identity of Cart2Cart our customers love so much, as well as main recognizable elements. Along with major changes to the website design, we decided to apply a few minor ones and touch up service’s logo. You won’t see any significant changes to it: we truly believe Cart2Cart has become a brand that instills trust and thereby needs to stay recognizable. So, instead, we polished the logo a little bit. You may see the comparison of an old vs new one below. You might haven’t heard about it, but Cart2Cart has a sibling. It’s a humble but powerful service to migrate data from files to shopping carts — File2Cart. Both developed and raised by the same hands, Cart2Cart and File2Cart always struggled to become one, integral unit. Thus, after many years of being teared apart, it’s now time to bring them together and merge their functionality for good! Thereby, you now can use Cart2Cart to perform migration from CSV files to any of 70+ shopping carts supported by the service! You’ll definitely love this one! At last but not the least, Cart2Cart rolls out 24/7 support ready to assist you every day of every week! That’s not exactly design change, but it’s so BIG we simply can not ring off. Whenever help is needed, our support team is online: even in 3 a.m. at Sunday. Pretty great, isn’t it? That’s the short overview of design changes occurred to Cart2Cart. We’re doing our best to improve the design and UX even more, adjusting it to the need of yours, our dear readers and users. So, wanna see all new features in action? We bet you do! Start a FREE Demo Migration and move your store swiftly, easily and securely to one of 70 world’s most popular shopping carts. Open new business opportunities with Cart2Cart!